“He that studieth revenge keepeth his own wounds green, which otherwise would heal and do well.” – John Milton (1608 – 1674) As soon as the Department of State Services (DSS), in obedience to relevant laws of the land relating to arrest and detention, released arrested Justices on personal recognition within 24 hours of arrest, a certain mixed feelings enveloped yours truly. Over time, the mixed feelings quickly transmuted into a cross breed of fear and eeriness. The reason for what looked like my needless worry was because going by the peculiar tendencies of our countrymen to convolute the air especially when caught in the act of doing evil; I very well knew that corruption will fight back with an uncommon ferocity never known before. After all, the bursting of judicial corruption in Nigeria was unheard of, and probably thought of as impossible, before now. Indeed, my major concern was that those arrested and released so swiftly would have sufficient time and company of evil associates who will present to them pages and options of scripts taken from their ignoble book of mischief on how to fight back. They will also provide legal assistance and deep purses to take the fight to President Muhammadu Buhari and his government. It only took a few hours before one of the embattled Judges, Justice Adeniyi Ademola dispatched a letter into the media space in which he strenuously blamed the Attorney-General of the Federation [AGF] and Minister for Justice, Abubakar Malami for his woes. According to the judge, “A DSS official finally informed me that my arrest was based on these three allegations; petition of Hon. Jenkins Duvie dated 4th of April 2016 to the National Judicial Council (NJC); granting bail to Col. Sambo Dasuki and the unconditional release of Nnamdi Kanu; and using my office to secure my wife’s appointment as the head of civil service, through Senator Bola Tinubu.” Ademola said he saw his arrest as revenge from Abubakar Malami, whose arrest and detention he ordered over a professional misconduct while he was judge in Kano between 2004 and 2008. Indeed, story for the gods! In his hurry to concoct an alibi, Justice Ademola conveniently forgot to expatiate on the petitions he acknowledged were written against him but rather dwelled copiously but disingenuously on the red herring he created around the AGF. The reasons for dragging in the national leader of the APC, Alhaji Ahmed Bola Tinubu and AGF Malami are many. He wanted the sympathy of BAT and his followers and in Malami, Justice Ademola found a fitting personality right in the heart of the Buhari government who he can use to blackmail the President and his government. Is there a better way for corruption to fight back than this? Just as Nigerians were conditioning themselves to the emerging melodrama by Justice Adeniyi Ademola, another embattled judge of the Supreme Court, Justice John Inyang Okoro and his collaborators in Akwa Ibom and Rivers State were concluding a different episode in what has now become the grand epic movie in which the central theme is the get-him-at-all-cost quest for Rt. Hon. 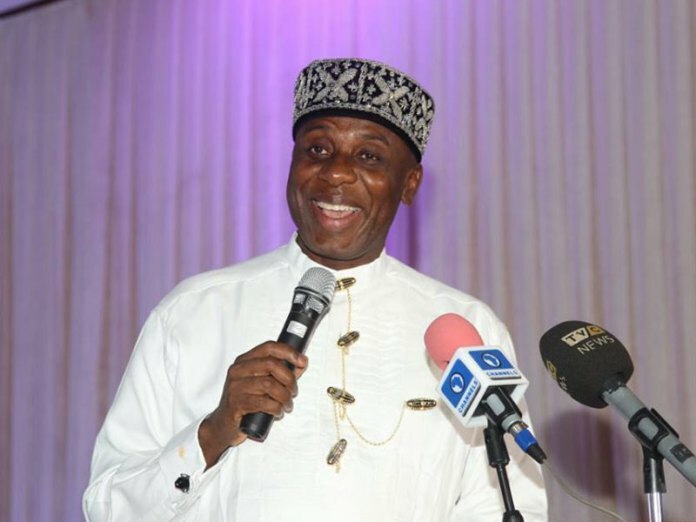 Chibuike Rotimi Rotimi Amaechi, the Minister of Transportation in the Buhari government. In a self-deprecating letter to the CJN and widely circulated in the media, Justice John Okoro rambled, huffed and puffed about how Amaechi approached him to pervert justice in the 2015 governorship election matters of Rivers, Akwa Ibom and Abia States. Not a few Nigerians have raised questions about the highly mendacious and self-incriminating letter by Justice John Okoro. What will be the basis for Amaechi to approach Justice Okoro to pervert justice in the Akwa Ibom governorship matter when he could not have been enlisted on the panel as an indigene of Akwa Ibom State? What really is the nexus between his wild allegations and what the DSS has accused him of? As men of the law, why is it that neither Justice Okoro nor the CJN followed the provisions of the law if an attempt was made to bribe a Supreme Court judge? Following on the heels of Justice John Inyang Okoro’s spurious allegations, came yet another letter by another Supreme Court judge, Justice Nwali Sylvester Ungwuta. Again, Ungwuta took refuge under the name of Rt. Hon. Chibuike Rotimi Amaechi who he shamelessly concocted white lies against, claiming the Minister attempted to bribe him to pervert justice in electoral matters. Ungwuta also dragged in Dr. Ogbonnaya Onu to further confer the toga of credibility on the plot by the shamed judges to square up with the PMB government and possibly halt the war against corruption as it relates to the judiciary. Today, what has become very apparent is that there were several well organised rehearsals by these embattled and alleged bad eggs in the judiciary to hit back at the very heart beat of the Buhari administration as corruption fights back. We know that the idea is that the easiest way to hit at the very heart of a strongman is to harm his favourite offspring. Same persons who are hell bent on humiliating the PMB government continue to explore from their mischief box. They started with avenging the defeat of their man, which seems to be failing. Now, they have turned on Amaechi and that will also fail. It is also worthy of note that all those who have been rueing their loss of the 2015 Presidential election have quickly regrouped to exact their pound of flesh from the very undisputed game changer and driver of the PMB victory which ensured the effective consignment of their Man Friday, the Otuoke man, to the backwaters of history. And that man is Rt. Hon. Chibuike Rotimi Amaechi CON.